Hey all, welcome back! Today I have a quick and easy minimalistic nail art tutorial for you. This is a different take in comparison to my more intricate nail art looks. Nail art style varies per person and I'd like to be able to offer a variety of options for all styles! 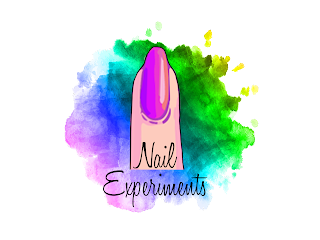 Minimalistic nail art is great for people who work in a profession where they're unable to have busy nail art, but still want a pop of fun without being too over the top. Or even for someone who has a more simplified taste in nail art. This look is perfect for the Fall/Autumn season but these techniques can easily be applied all year round. Let's get onto the fun! I began by applying OPI nail polish Sleigh Parking Only to my index, middle and pinky finger nails. Once the first coat had some time to dry down, I went in with a second coat of the nail polish to reach full opacity. Once the second coat of nail polish was dry, I sealed in those nails with a quick drying top coat. I used the top coat from Glisten and Glow. While those nails were in the process of drying, I took that opportunity to work on my accent nail - the ring finger nail. To achieve the negative space look on my accent nail, I used a right angle chevon guide vinyl from My Nails Did. I peeled the vinyl off the sheet using a pair of tweezers, placed it overtop my nail and using the tweezers, I gently pushed the vinyl down into my side walls. That's an important step as it will ensure the nail vinyl is flush with the nail and will prevent nail polish from seeping/flooding underneath. The goal is to have clean crisp lines once it's time to peel the nail vinyl off. Using OPI nail polish in Sleigh Parking Only, I filled in the bottom half of my nail. I made sure to have a generous amount of product on the brush itself versus going in with two thin layers. While the nail polish was still wet, I used tweezers to pull off the nail vinyl. It's important to peel the nail vinyl off right away while the nail polish is still wet as it will allow for crisp and clean lines! If you wait for the nail polish to dry down and peel, the lines may not be as crisp. Once the accent nail had a bit of time to dry down, I went in and applied one glossy coat of quick dry top coat. While the top coat was still wet, I took a silver diamond shaped nail stud (bought a variety wheel off eBay) and sunk it into the topcoat. This will allow the nail stud to adhere to the nail. For a stronger hold, feel free to add some nail glue underneath the nail stud for further reinforcement. At this point, the rest of my nails have ample time to dry down and it was time to work on my middle accent nail. I began by applying Lace Liquid Latex from Twinkled T on my skin and cuticle surrounding my nail to protect from the upcoming nail stamping. It helps to make clean up minimal and prevents excess stamping polish from transferring onto the skin. Using a silver stamping polish from Twinkled T called Lowkey, The Big Bling XL stamper from Clear Jelly Stamper and a geometric image from WhatsUp Nails stamping plate B015 Geo Radical, I transferred that overtop my middle nail. Using tweezers, I began peeling by the liquid latex and cleaned up the minuscule tid bits of stamping polish left over by using a clean up brush dipped in nail polish remover. Feel free to skip out on the stamped middle nail if you feel it's too much for your personal taste. 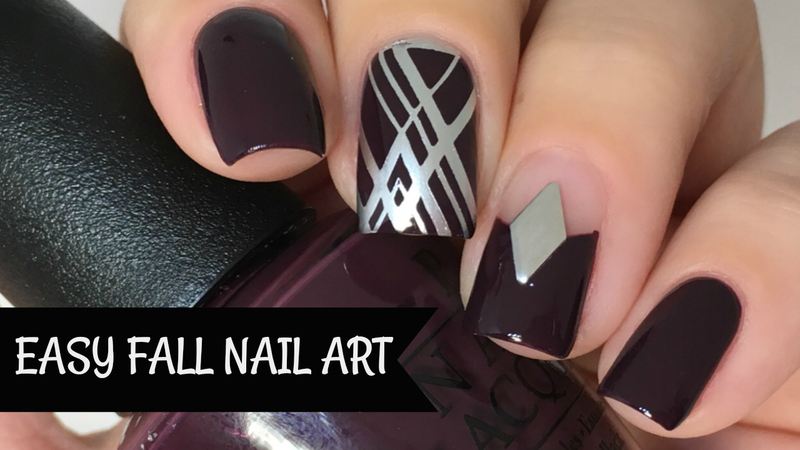 You can even skip out on the nail art gem on the ring finger nail and just enjoy one accent nail with the negative space. Your nails are your canvas, so feel free to do as you please - your nails = your rules! The possibilities with nail art is endless and feel free to switch up placement, base nail polish colour(s) etc to meet your personal style and preference - creativity is at your fingertips! 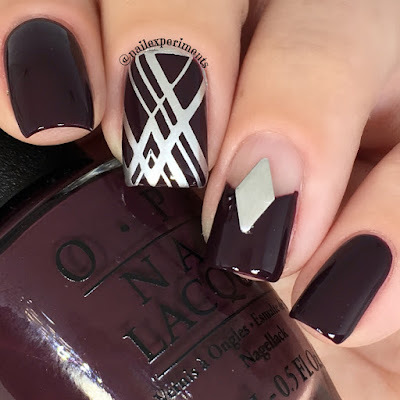 I hope you all enjoyed this minimalistic nail art look and I would love to hear your thoughts in the comments section down below! Certified nail technician with a passion for all things beauty!